It was a bitter sweet time for the United States Air Force's only Vietnam ace after he blew his first MiG out of the sky on May 10, 1972. It was on that day then-Capt. Steve Ritchie, USAF, not only scored his first MiG-21 kill but lost his good friend and squadron mate Maj. Bob Lodge to enemy fire. "We were going to meet a flight of MiG-21s head on, and we did meet MiGs head on back then," now retired U.S. Air Force Reserve Brig.Gen. Ritchie said. "We knew the MiGs would be orbiting in a confirmed area, and we were going after them." For several days intelligence and mission planners of the 432nd Tactical Fighter/Recon naissance Wing has been gathering data on the aircraft type, location and flight patterns of the Russian made aircraft, Ritchie said. They were looking to protect the bombers on the kickoff to the original Linebacker assault. May 10, 1972 was one of the more important days of the war. 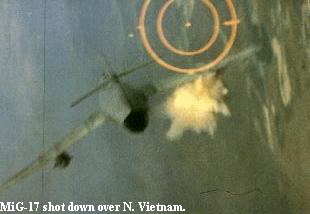 It was the most intense day of air combat during the Vietnam conflict, many feel. Ritchie and his air combat crew brethren were tired of taking it from the MiG drivers. It was Air Force's turn to give it back to the North Vietnamese. That day, in Oyster flight, Ritchie was flying in the number three slot of a four aircraft flight. Their job was to draw the orbiting MiGs away from another flight of F-4s that were to drop laser guided bombs on a Hanoi target. The mission was part of the Linebacker campaign -- which was a series of intensive bombing sorties on North Vietnam designed to bring them to the Paris peace table. "We were orbiting at about 300 feet, about 30 miles west of 'Bullseye' or Hanoi," Ritchie said. "Then we picked up the MiGs orbiting northwest of Hanoi." The plan was to monitor the MiGs until the pilots of the Russian aircraft moved to attack the incoming strike force, Ritchie said. "Bob Lodge was leading the flight in Oyster One, and I was the deputy flight leader in the number three position," Ritchie said "The plan called for lead and two to fire at the MiGs head on at a range of about seven miles." The F-4s went head on with the MiG-21s and as planned Lodge and his wingman fired off their radar controlled AiM-7 Sparrow missiles. The pilots got their warbling tones, and after pressing the triggers the Sparrows dropped from the underside Phantom missile wells. Locking onto the radar beam, the missiles accelerated to terminal speed and sought their targets -- a pair of MiG-21s. Homing in on the enemy aircraft, the Sparrows did their jobs that day -- a rare thing during the Vietnam War because the radar missiles had a reputation for being unreliable. The MiGs were blown out of the sky when the missiles explosions tore into the thin metal fuselage of the aircraft. Two others were left. Ritchie said the flight went after the remaining MiGs. "We turned as hard as we could to get behind the MiGs," he said. "At that point I managed to get a lock on one of the remaining planes and I fired off two missiles." Ritchie said the missiles were fired at the minimum limit of their radar parameters. The second Sparrow exploded under the third MiG. The expanding steel of the the blast fragmented -- doing its job and thrashing the MiG full of holes. Smoking, venting fuel and on fire, the MiG began a death spiral to the ground below. The pilot managed to eject. Meanwhile, Lodge and his backseater Roger Locher, were intent on knocking out a fourth MiG, Ritchie said. "We saw a flight of MiG-19s coming in from behind readying for an attack on Oyster One," Ritchie said. "We screamed over the radio for them to break off the attack, but as happens even with the best pilots they had what we call `target fixation' on that last MiG." The incoming MiGs pounced on Lodge and Locher. The attacking pilots pressed the triggers activating the MiG-19s powerful cannons, and covered the American Phantom with 37mm cannon fire. A tough machine the Phantom, but the blasts were too much for it. The rounds pummeled the twin engine fighter; the beating was incredible, and the machine was flipped over. Lodge and Locher were stuck in a death trap. Ritchie said he saw the American fighter plummeting out of the sky upside down and on fire. Ritchie said the last MiG-21 along with the MiG-19s chased the rest of the Oyster flight out. Locher managed to eject, but Lodge was battling the aircraft, and rode it in. "With over 400 missions, they were considered the best aircrew in Southeast Asia by some," he said. "It just goes to show you what can happen even with the most experienced crews." The story doesn't end with Ritchie. Locher managed to eject. The canopy was bubbling from the heat of the aircraft fire. He called Lodge on the intercom and told him he was leaving the aircraft. Ejecting, Locher managed to get out of the aircraft safely, intact. Important back then because the Phantom ejection seat -- the Martin-Baker -- had a nasty habit of tearing off legs and arms snagged during the ejection process. Locher hit the ground running -- literally. The weapons system operator came down in a bowl like basin. He fell back on his escape and evasion training, and what is one of the most magnificent stories of the war, Locher managed to evade capture by the North Vietnamese. After 23 days in the jungles of North Vietnam, Roger Locher was rescued. "That was a great day when we snatched him from the jungle, but it was still a bitter sweet time because of the loss of (Lodge)," Ritchie said. Ritchie went on to blow four more MiG-21s out of the communist held skies of North Vietnam -- making him the only Air Force ace pilot to come out of the Vietnam war. "I am the only ace pilot to shoot down five MiG-21s, and the day after I shot down the last one, there was an order waiting for me. It instructed me not to fly any more. They (DoD officials) felt like, since I was the only MiG-21 ace, that if I were to be shot down it would be a great propaganda victory." Almost three decades later, the environment has changed in the United States Air Force. "The planes we have today," Ritchie said after a ride in an F-16, "are a quantum leap over what we had when I flew in Vietnam." The training today's fighter pilots also rank with the craft they fly -- the best, Ritchie said. It was not always that way. When Ritchie was coming through pilot training conventional "wisdom" of the time dictated that there was not need for air combat maneuvering. No need to practice the 50 years of lessons learned since men and machines took to the skies to wage war over the Flanders Field in France. Aircraft designers of the time thought the mighty missile would do everything that was needed. Men paid for those lessons with their blood and freedom. Ritchie remembered the times with a tinge of bitterness to his voice. "Until I was over Hanoi, I never saw a dissimilar aircraft," Ritchie said. "We just didn't train that way 30 years ago." One of the reasons training was hampered back then, Ritchie said, was because Air Force officials felt like danger involved in that type of aerial maneuver training would cause in-flight accidents. "But that just isn't so," Ritchie said. "We train our pilots with aggressor squadrons and dissimilar aircraft and our pilots are better trained and the accident rate is lower now than it was then." 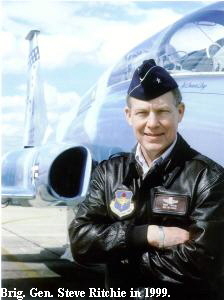 In a letter to Air Force officials, after he returned from Vietnam, Ritchie and other combat pilots recommended several changes to the way the Air Force trains pilots. One of those recommendations, he said, was the use of aggressor squadrons. "Soon after that, the Air Force began flying the `Red Flag' missions out at Nellis (Air Force Base, in Nevada)," he said. Ritchie said the lessons learned from Vietnam lead to the stunning victories in the Persian Gulf War. "You bet it did," he said. "We basically did everything wrong in Vietnam and did everything right in the Gulf," he said. "We were sent to Vietnam and told to fight, but we were not allowed to win. That is immoral."